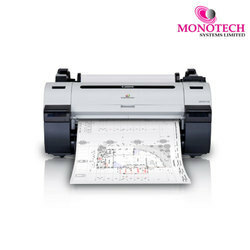 With immense market knowledge, we have been able to provide optimum quality Large Format Inkjet Printer. HP 5800 Designjet Production Printer, This machine is working on Bulking System, Low Running Cost, High Quality, High Speed. this is best for indore Branding. - Characters height from 7 to 60 mm, using different print heads. - Printing systems for medium/high line speed. - For marking on any material in low and medium resolution. - Suitable for marking on packages made of paper, carton, wood, PE, PVC, plastic materials, metals, pipes, cables, etc. 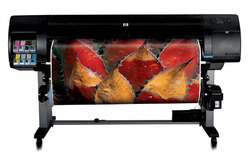 - Print smart with the imagePROGRAF iPF815 / 825, which delivers 2400 x 1200 dpi resolution. Auto paper switching, a high-capacity media basket and ink/paper detection features bring optimal results. We are a top notch supplier of Large Format Inkjet Printer. - High Reliability due to modular, all stainless steel construction. - Advance Hydraulic System requiring no expensive compressed air. - Superior economy using a simple, refillable, bulk ink system. - 7-16 drop per head capability enabling large logos and 1-3 lines of print.